CEOs at BT Power Breakfast in Kolkata say that, troubles aside, things are changing for the better in West Bengal and growth will follow. Standing from left: Partha Ghosh, Moloy Banerjee, Ravi Todi, George Kuruvilla and Josey Puliyenthuruthel John. Sitting from left: S.K. Agarwal, Umesh Chowdhary, R.K. Chajjer and Uttam Bose. Photos by Subir Halder. Freedom fighter Gopal Krishna Gokhale once said: "What Bengal thinks today, India thinks tomorrow." This statement is no longer relevant and we have seen flight of talent as well as capital from the state that lags behind many others in industrialisation. Many companies, such as Hindustan Motors and Shalimar Paints, have shut down manufacturing in the state over the past few months. At the same time, Chief Minister Mamata Banerjee is trying to bring investments and even visited Singapore with industry leaders recently to woo investors there. Against this backdrop, Business Today gathered a galaxy of corporate leaders to discuss how the state can return to its glory days. 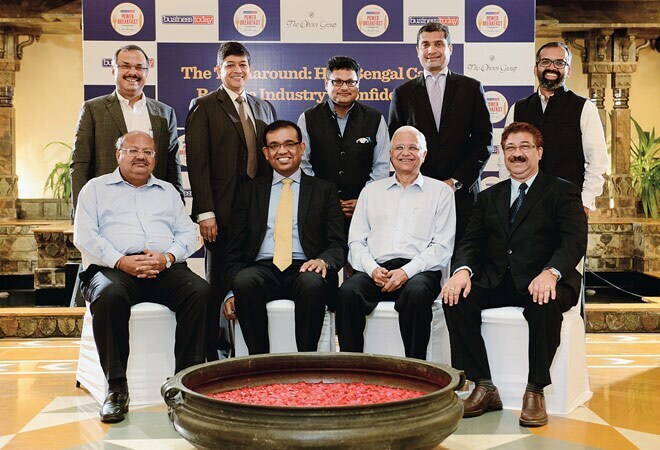 Organised in association with The Oberoi Group in Kolkata on September 1, the discussion's topic was The Turnaround: How Bengal Can Restore Industry's Confidence. The panellists included Umesh Chowdhary, Vice Chairman and Managing Director of Titagarh Wagons; Partha Ghosh, Managing Director of Bengal Aerotropolis Projects; Ravi Todi, Managing Director of Shrachi Group; Moloy Banerjee, Managing Director of Linde India, R.K. Chhajer, President of Calcutta Chamber of Commerce; Uttam Bose, Managing Director of Hindustan Motors Finance Corporation; and S.K. 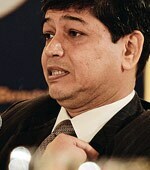 Agarwal, Managing Director of Kamarhatty Company. Josey Puliyenthuruthel, Managing Editor, Business Today, moderated the discussion, which lasted nearly two hours and brought out different perspectives. 'Bengal will have to look at services to bring growth. The state is blessed with skilled manpower to grow health-care, education...' says Ravi Todi, MD, Shrachi Group. 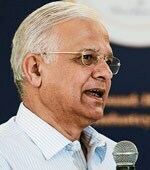 George Kuruvilla, General Manager of The Oberoi Grand, hosted the event. The industry captains agreed that West Bengal has a mindset problem and industrialisation will remain difficult due to the prevalence of fertile farm land. "West Bengal will have to look at services for growth. The state is blessed with skilled manpower to grow services such as health care, education and entertainment," said Shrachi Group's Todi. Land acquisition issues have in the past prompted Tata Motors to scrap its Nano minicar project in Singur, and Indonesia's Salim Group to withdraw from a special economic zone project in Nandigram. 'The government has to support modernisation and labour reforms should be done,' says S.K. Agarwal MD, Kamarhatty Company. Chowdhary of Titagarh Wagons, who accompanied the CM on her Singapore visit, said that the state has continuously declined as far as business is concerned even though it has done well in agriculture and land reforms. Indices such as the ease of doing business have not been positive and as a result, there has been capital erosion. "For the people in Bengal, business and profit have historically been dirty words. This mindset is changing across the board. We must understand that we have a problem of perception, which is a legacy of decades and cannot be changed overnight. The government has been continuously making the right noises as far as business is concerned." The panellists were of the opinion that the CM's Singapore visit did help clear up many negative images from the past. 'The process of restoration of confi dence in industry has started. 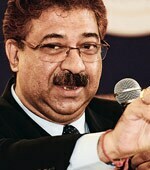 Nandigram and Singur were blots... aberrations, not the rule,' says R.K. Chhajer, President, Calcutta Chamber of Commerce. "Perceptions of the past are overshadowing realities of the day and it needs to change," added Chowdhary. Kuruvilla of The Oberoi Grand stressed that the critical element of packaging needs to be taken care of. "Things have to be put in motion. The time has come to get on and make things happen." Singapore's Changi Airports International has already taken a 26 per cent stake in the Rs 10,000-crore airport-township project that is being set up in Andal, less than 200 km from Kolkata. Ghosh, whose company Bengal Aerotropolis is setting up the 2,300-acre project, said the state suffers from lack of packaging. 'The state suffers from lack of packaging. While there are issues, good things have also happened,' says Partha Ghosh MD, Bengal Aerotropolis Projects. "While there are issues, certain good things have also happened. Conversion of land holding has been streamlined for industry and infrastructure projects. This has not been talked about adequately." 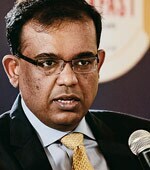 Linde India's Banerjee said that West Bengal offers advantages in the form of low overheads since the cost of living is lower. But the state lacks the comfort of living. "We face difficulties in attracting talent to live in Kolkata." He agreed that the state's GDP will progress through services and to grow services, there is a need to improve the ease of living to attract people to come and stay here. Active trade unions in the state have also hampered its image and dented investors' confidence. 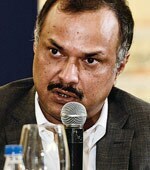 Bose of Hindustan Motors said his company had been looking for strategic partners for its Uttarpara unit that was closed a few months ago. "A lot of interest has been shown in our proposal but confidence level is low due to issues related to labour and productivity. As a manufacturer, my biggest problem in Bengal is productivity... The level of productivity is higher in other states. Now the trade unions are changing. They realise that they need to be productive." 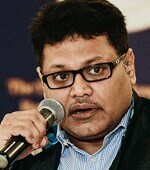 Kamarhatty Company's Agarwal agreed with Bose and said there is resistance to modernisation in Bengal. "The workers are resisting since modernisation will decrease the requirement of labour. The government has to support modernisation and labour reforms should be done." 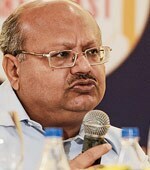 Banerjee said that productivity in West Bengal is low. "The national per capita GDP is 35 per cent more than that in West Bengal. There is resistance to higher productivity because of anti-capital mindset. There has to be a change in mindset of labour unions." The panel agreed that Bengalis seem to do very well when they go out but they are not at their productive best in their home state. "There are problems at the grassroot level in Bengal. Cholbe na (Bengali for things won't work) is an image problem that typifies Bengal. The state needs to convert it to Cholbe," said Banerjee. Chhajer of Calcutta Chamber of Commerce said that the process of restoration of confidence in industry has started. "Nandigram and Singur were blots. We need to take them as aberrations and not the rule. The government means business now. Infrastructure is developing in the state and not just in Kolkata." '... My biggest problem in Bengal is productivity... The level of productivity is higher in other states, says Uttam Bose, MD, Hindustan Motors Finance. Chowdhary said there is renewed interest in the government to make things work for industry and a clear message has been sent that industrial unrest backed by politics will not be tolerated. The government has done two review meetings after the chief minister's Singapore visit to take stock of the progress. The industry is hopeful that the efforts being made by the state government on supporting industries will send a message and bring in new investments to the state. The state is reportedly planning an investment summit - on the lines of the Vibrant Gujarat investors' meeting - in January next year. BT's Puliyenthuruthel concluded the event by saying the discussion gave a sense that there is a very strong reason for optimism. "We might be at the cusp of something that is dramatically different than what has been happening in the last few decades. There is no reason why Bengal cannot grow like the rest of the economy." Will govt's new approach for financial inclusion work?